Beginning as a black-powder revolver round, the .45 Colt, or 11.48x33mmR, dates back to 1872. For the modern round, a magnum-level hunting round is used. Adopted by the US Army, the .45 Colt served as an official US military handgun cartridge for fourteen years. The .45 Colt is also called the .45 Long Colt or the .45LC. Note: this caliber is not the same .45ACP The Armory stocks a wide range of 45 ammo to satisfy the needs of plinkers, hunters, competitive shooters, and the avid ammunition aficionado. 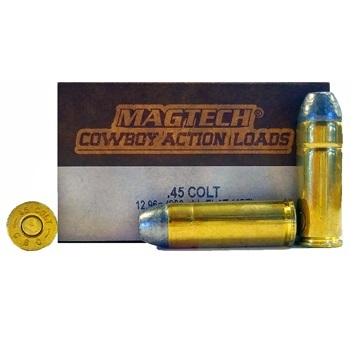 Being avid shooters ourselves, we enjoy trying out new 45 ACP ammo and try to offer you 45 ammo at very aggressive prices so that you can share in our most favorite pastime. Thanks to the miracle of Just-In-Time Distributing (JITD), I can also take special orders for almost any PMC, Winchester, Federal, Mastercast, GoldDot.